I thought I would start a new series of blog posts today, showing you the six beauty products I am lusting after the most each month. I like to make a note of the products I want to try so I can look out for them going on sale or special offer and this also means I don’t forget what I want to try. Lets look at what is on my November wish list. The hairdryer I am using at the moment is ok but it is quite big and bulky due to having a long nozzle – is that the correct term – and this causes it to be clumsy and heavy. 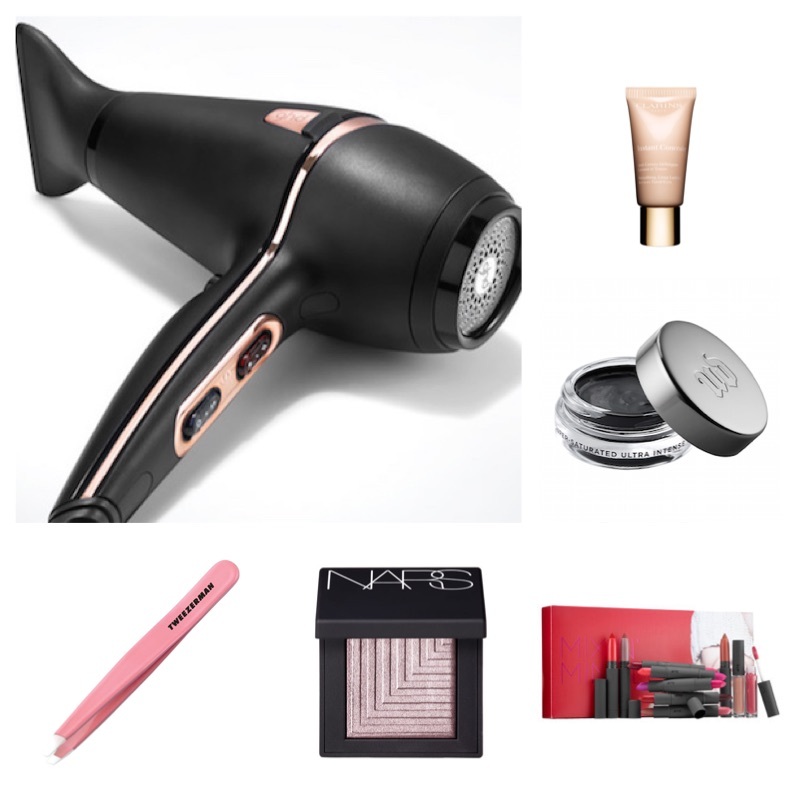 I have been searching around for a new one for a while and when I stumbled across the GHD Air Hairdryer on lebeautygirl.com I thought it is just what I am looking for even though she mentions it is a tad heavy. I popped over to the GHD website and saw they had a limited edition rose gold edition, that is when it jumped straight to the top of my wish list. The GHD Air Hairdryer retails for £99. Another blogger enabled product is the Instant Concealer from Clarins. I first saw this on musingsofamuse.com – I love her blog by the way, she is great – and thought it sounded like something I was missing in my collection. I have trouble with concealer creasing under my eyes as I have a line under each one, and I also have a problem with my eye area looking dry so my concealer does’t sink in very well. I would encourage you to read her post on the concealer for a more in depth review but basically it is supposed to reflect light to help hide dark circles, moisturise the eye area and blend flawlessly into the skin – sold! The Clarins Instant Concealer retails for £21. I recently ran out of my MAC Fluidline in Backtrack so have been on the hunt for something new to try. After looking on various beauty websites I decided the Urban Decay offering was the one to add to my list as it claims to be super pigmented and waterproof whilst also being easy to use. I’m holding out for as long as possible to purchase this as I do have another MAC Fluidline in Blitz n Glitz on the go that I want to use up first. You can now purchase Urban Decay products from urbandecay.co.uk as well as all the usual stockists. The Urban Decay Cream Eyeliner retails for £16. I have only tried three products from Bite Beauty (Agave Lip Mask, Luminous Crème Lipstick and High Pigment Pencil) but I love all three of them. I also love the concept behind the company. They focus on creating good quality products that contain natural and organic ingredients. I came across the Mix N’ Mingle set whilst browsing the Sephora.com site. The set includes 5 Luminous Crème Lipstick Duos, 3 Matte Crème Lip Crayons and 2 Lush Fruit Lip Glosses all in deluxe mini size. There looks to be a great range of colours and finishes in the set. This would make an excellent gift for any lip product lover. The Bite Beauty Mix N’ Mingle set retails for $98 (approximately £65). I think I first heard about these on the NARS.co.uk website and at first I wasn’t really interested in them as I don’t usually purchase single eyeshadows. But when I saw Vivianna Does Makeup and Lily Pebbles raving about them I thought that maybe I should have a closer look. I looked at swatches of the 12 colours and immediately fell in love with Callisto which NARS describes as an “icy pink silver”, however from what I can see from swatches it looks more like a pale shimmery taupe. NARS Dual-Intensity Eyeshadows retail for £21. I have been using the same pair of cheap tweezers that I got in a manicure type set for years, so I feel it is about time I invest in a decent pair that might make it easier to pluck my eyebrows. The good thing about investing in a pair of Tweezerman Tweezers is that you can get them sharpened for free (except the cost of postage to the USA), therefore once I have purchased them I shouldn’t have to buy another pair of tweezers again – in theory that is. I love that they come in a variety of different colours but this could cause a problem when it comes to deciding which ones I am going to buy! Tweezerman Slant Tweezers retail for £20.50. Is there anything you are lusting after? Let me know in the comments below.